If you're considering getting a RolliBot floor cleaning robot, you may find this article useful in helping you with selecting the right RolliBot for your home. Note that RolliBot has produced a number of vacuuming and mopping robots, and therefore, to simplify your task of choosing the right robot for your needs, we will only consider the most popular and best rated ones bought by Amazon customers. 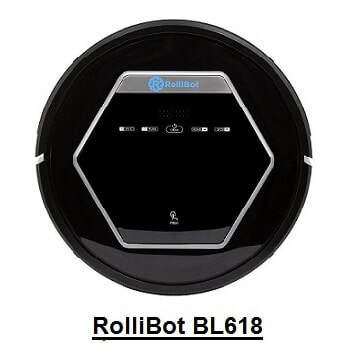 At the time of this writing, the most popular and best rated RolliBot robots in the vacuuming & mopping category were LaserEye 600, LaserEye 601, GENIUS BL800, BL618 and MINI BL100.The following article will compare in detail these robots. Note that LaserEye 600 and LaserEye 601 are identical robots except for their color. 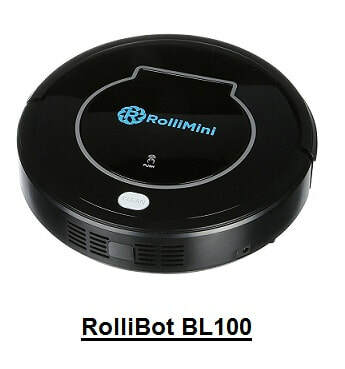 This article will compare the RolliBot LaserEye 600, LaserEye 601, GENIUS BL800, BL618 and MINI BL100 robots. Otherwise, please read on below for a detailed comparison of the above listed RolliBot robots. 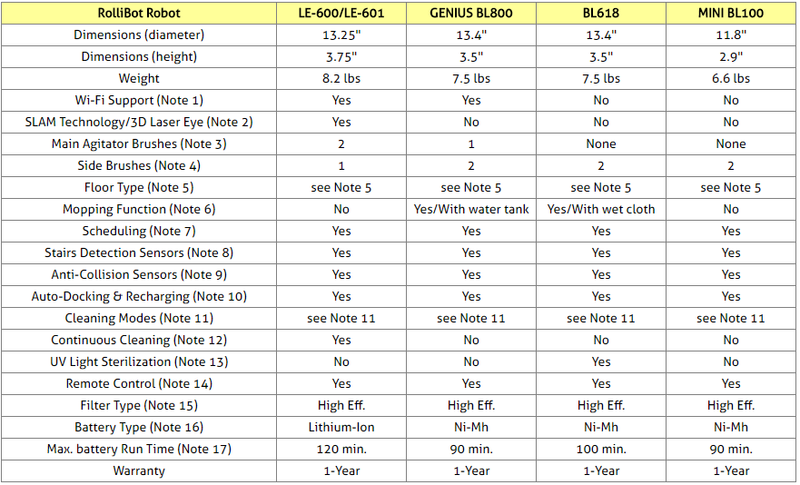 ​The following table compares the RolliBot BL100, BL618, BL800, LE-600 and LE-601 robots. Only RolliBot LE-600, LE-601 and GENIUS BL800 support Wi-Fi. Therefore, they can be controlled from anywhere using your smartphone after you download the RolliBot App to the smartphone, and as long as the robot is connected to your home's internet via Wi-Fi. You can use the App to schedule, start, stop, steer, pause, switch between cleaning modes, choose spots to clean, and check battery status. When using the RolliBot LE-600/601 App, you can even view a 2D map of cleaning results. LE-600 and LE-601 robots are equipped with a laser eye and use the SLAM (Simultaneous Localization and Mapping) technology. These robots are capable of scanning and analysing the surroundings in order to construct a map of the space to be vacuumed and determine how best to clean, while simultaneously keeping track of their location within that space. LE-600 and LE-601 utilize state of the art laser mapping to actively locate wall and furniture positions, so that these robots won’t get lost even when you rearrange rooms. They become smarter and more efficient the longer they work. In fact, after they auto-recharge themselves, LaserEye robots remember where they cleaned last and resume the job on their own! LaserEye 600 and 601 robots are equipped with two main agitator brushes: a rubber brush and a bristled roller-brush that sweep dirt and debris into the suction area. BL800 is equipped with one bristled main agitator brush that can optionally be removed for direct suction which is good on bare floors when there is lots of pet hair and debris. A direct suction accessory is included. Removing the brush and placing the direct suction accessory is very easy. Both BL618 and BL100 have no main agitator brush. They only have 2 side/edge brushes. Therefore, they are best for use on bare floors such as hard floors or tiles. Each RolliBot vacuuming robot considered here is equipped with either 1 or 2 side/edge brushes which spin and draw dirt and debris in, towards the vacuum so baseboards and corners stay clean. LE-600, LE-601and BL800 robots are suitable for both bare and carpeted floors as they are equipped with one or more rolling agitator bristled brushes, as well side brushes. BL618 and BL100 are best on bare floors such hard floors or tiles as they have no main agitator bristled brush and use direct suction as well as side brushes to clean the floors. LE-600, LE-601 have and BL100 are not used for mopping. They are used only for vacuuming. BL800 can be used for mopping while vacuuming and is equipped with a 1.2 inch tall small water tank that attaches to the bottom of the BL800. A cloth mop then attaches to this removeable tank on the bottom by a velcro like substance, and it stays wet by absorbing water from the tank. BL618 can be used for mopping while vacuuming. A wet cloth pad can be attached to the robot when mopping is desired. There is no water tank. The water tank is not necessary for the mopping feature, but it does increase the area the robot can mop without intervention (i.e. re-wetting the cloth). All RolliBot robots considered here can be scheduled to clean automatically once a day, at a specific time. You can schedule the robot to clean at a specific time every day of the week or at different times on different days of the week. All RolliBot robots considered here are equipped with anti-drop sensors that can detect stairs. Therefore, these robots can clean up to and around stairs without the risk of falling. All RolliBot robots considered here are able to move safely around your home using smart anti-collision sensors to detect objects in their path and navigate around them, for uninterrupted cleaning. Note that, because LE-600 and LE-601 robots are equipped with a laser eye and use SLAM technology, they are the most effective in detecting and marking obstacles in the space to be cleaned. When battery power gets low, all RolliBot robots considered here automatically return to recharge, all by themselves. Auto cleaning: In this mode, the robot will clean a room automatically and adjust its cleaning behavior based on specific situations. Spot cleaning: In this mode, the robot will clean intensively in a spiral patter to clean a particularly dirty area. Edge cleaning: In this mode, the robot will clean along the wall or obstacles. Zig-Zag cleaning: This mode is good for an open area or floor mopping. Because they use the SLAM technology, after recharging themselves, LE-600 and LE-601 can restart and resume automatically the job that was interrupted before going to home base to recharge. These robots mark a 2D map that you can view on your smartphone with the area that was cleaned. You can see "gray" areas on the 2D map, identifying the areas that have not yet been vacuumed, and white areas marking those that have been cleaned. After the robot docks itself, it recharges and resumes the cleaning; it will go to a "gray" area and begin vacuuming again. It may not resume exactly where the job was left off, but it will choose the most efficient pattern after cleaning resumes, in order to clean a set area in the most efficient manner. All RolliBot robots considered here come with a remote-control device that can be used for controlling, scheduling, status checking, etc. as long as you are around the robot. Note that LE-600, LE-601 and BL800 can also be controlled remotely from wherever you are using your smartphone as long as they are connected via your home's Wi-Fi and to Internet. All RolliBot robots considered here are equipped with High Efficiency (HEPA) filters that remove from the air harmful allergy causing elements such as pet hair, dust particles, pollen and dander to create a cleaner breathing environment. These filters can be removed and washed easily as explained in these robots' user manuals. Lithium-Ion batteries are known to last longer before needing to be replaced and offer longer run times at full charge when compared with Ni-Mh batteries of equal power. ​​So which RolliBot vacuuming robot should you get? 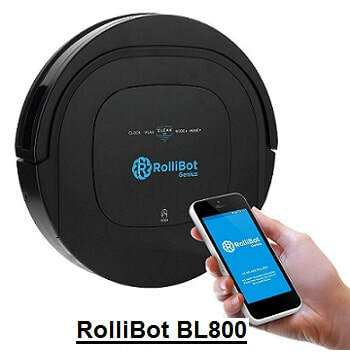 If you wish to be able to control your RolliBot from your smartphone, you should consider either LaserEye 600, LaserEye 601 or BL800. If you have only bare floors (no carpets), a BL618 or BL100 should be quite adequate. If you also want your bare floors mopped, you should consider either the BL800 or BL618. But note that, while BL800 is equipped with a water tank that keeps the attached mopping cloth pad wet, BL618 does not have a water tank, and you need to wet the cloth pad yourself before attaching it to the robot. If you want to have the option of removing the main brush for direct suction which is good when there is a lot of pet hair and debris on bare floors, you should consider the BL800. If you want your floors UV sterilized while being vacuumed, you should consider the BL618. They are the only ones that are equipped with a laser eye and use SLAM technology, making them more accurate and efficient in terms of evaluating and planning the space to be cleaned and avoiding obstacles. They are the only ones that are equipped with two main agitator brushes (one rubber and one bristled). Therefore, they can do a better job on carpeted floors than the other RolliBot robots which either have a single or no agitator brush. They are the only ones that can resume automatically the job that was interrupted before going to recharge themselves. That is a great feature for larger homes that require the robot to recharge a number of times. With this feature, you will not have to restart the robot after each recharge, and after each recharge, the robot will resume the cleaning in the most efficient way.